Our 2-15 pre-licensing course and pass-prep material help you pass your state exam! The Pre-licensing Course is structured to meet Florida pre-licensing requirements. Several tools are provided within the course to make your learning straightforward and comprehensive. The Pass Prep Course uses a question and answer model unique to OLT that provides students only with correct information. The main goal of this course is to prepare students for the state licensing examination by building their confidence. The Practice Exam Generators are an ideal way to evaluate your level of knowledge prior to taking the actual state insurance agent exam. The Tutorial takes an in-depth look at Life, Health, and Annuities so that the student can be prepared not only for their state exam but for their career in the insurance industry. This course is designed to prepare a student to become a 2-15 Health and Life agent without the loss of production income and time. Work at your own pace with your instructor available via e-mail or telephone. Upon successful completion of this course, you will be eligible to sit for the state examination. 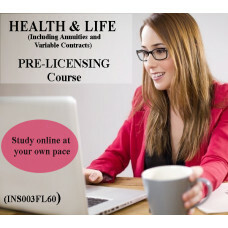 This course is designed and taught to comply with the State requirements for the Health and Life (including Annuities and Variable Contracts) Agents (2-15) State Examination. (This l..